Peaches make me weak in the knees. So much so that every July at our farmers' market when we see the return of the "peach ladies" (from Tenerelli Orchards, who grow the most exquisite peaches that I have ever tasted, our whole family celebrates. I need someone to take a picture of this moment next year to prove it because we truly are that nerdy about it. You would think we had just won a new car on a game show. I buy an entire flat (about 20-25 peaches) every week during the months peaches are in season. I turn them into fruit leather, peach crumble, summer fruit gazpacho (the kids loved this as babies), a special peach cake Kenya came up with, popsicles, and course we eat a lot of them just on their own. 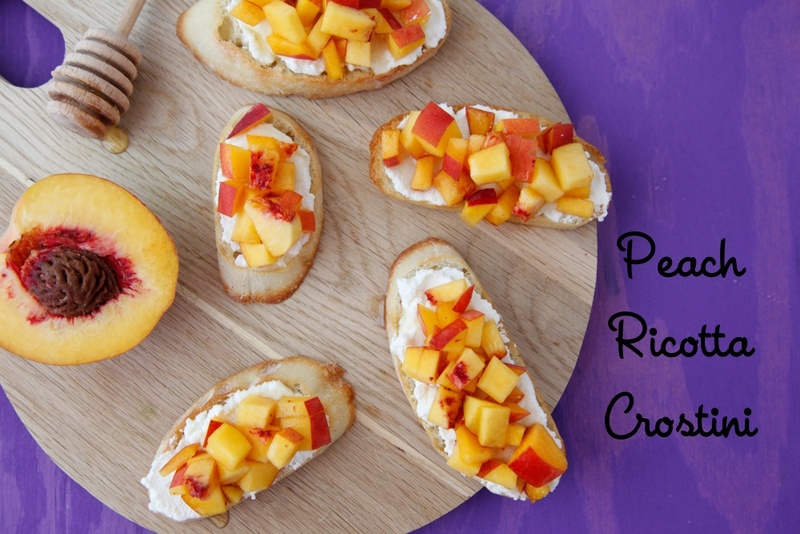 I made this crostini recipe for an afternoon snack the other day after the kids came home from camp exhausted and ravenous. I assembled everything and then let the kids squeeze the honey on top. Chloe looked at me with twinkling eyes and exclaimed she needed to drown her's in honey, while Kenya's preference was more of a drizzle. After he gobbled up two in a row he smiled at me and said, "everything is better with peaches". I couldn't have said it better myself. 2. Slice the baguette into 1/2 inch pieces. Lightly brush or spray the slices with oil. 3. Place the bread slices on a cooking sheet and bake for 3-5 minutes, until golden brown. 4. 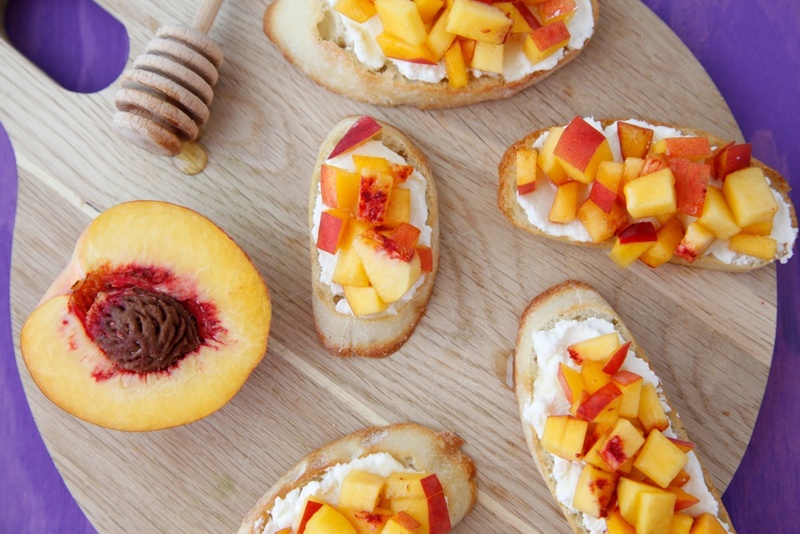 Allow bread to cool completely, then spread each piece with 2 tablespoons of ricotta, top with 2 tablespoons of chopped peaches, and drizzle with honey. Try this with strawberries also. So delish!!! I made it without the bread. Who knew honey and ricotta cheese. Tastes like cream! We always have ricotta cheese in the fridge but it tends to expire about a week or 2 after purchase so great way to use it up when in hurry!